Amid sky-high Democratic enthusiasm and a developing “blue wave,” Republicans can’t afford a war with Trump that depresses GOP turnout….“The president is, as you know — you’ve seen his numbers among the Republican base — it’s very strong. It’s more than strong, it’s tribal in nature,” said Sen. Bob Corker, R-Tenn., who decided to retire when his second term concludes at year’s end, after periodically sparring with Trump. “People who tell me, who are out on trail, say, look, people don’t ask about issues anymore. They don’t care about issues. They want to know if you’re with Trump or not,” Corker added. 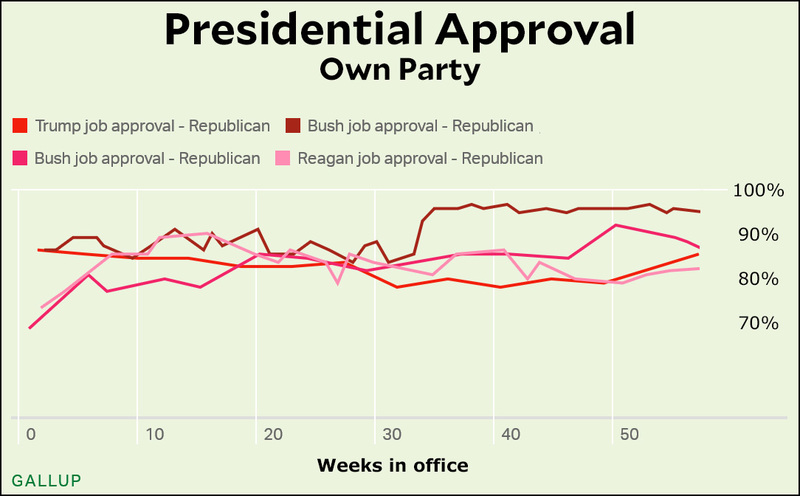 Trump’s numbers have risen over the past couple of months, but he’s still very much middle-of-the-pack compared to other Republican presidents at this point in their terms. He’s also only about three points higher than Obama was among Democrats. So sure: Trump is popular among Republicans. But he’s hardly sky high or anything. Right now he places third out of the past four Republicans.